Bolton Wanderers have confirmed they have paid off their outstanding tax bill to HM Revenue & Customs following their recent takeover. Dean Holdsworth's Sports Shield consortium and Ken Anderson's Inner Circle bought the club last week. The Championship's bottom side were due back in the High Court on 21 March over the £2.2m bill which had been adjourned three times previously. The club now expect the winding-up petition against them to be lifted. Bolton have also announced that their former midfielder Peter Reid has joined the club in an advisory role for the rest of the season. The ex-Sunderland manager, 59, who made 257 appearances for Wanderers after coming through their youth system, will assist interim manager Jimmy Phillips and the coaching staff. "We all know it has been a difficult time for the football club, but hopefully between now and the end of the season we can get a couple of results," he told the club website. "This is a club that I hold very close to my heart. 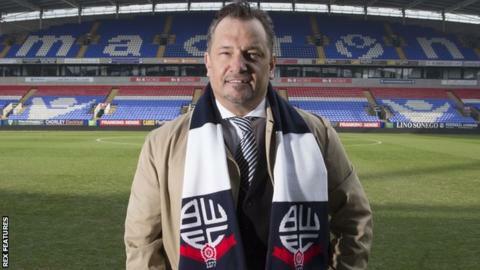 It's a fantastic opportunity to come back to a great football club and work with some great people."